They are also wrong in regard to the pari-mutuel Derby future bets offered by Churchill Downs through various wagering hubs, including TwinSpires. The reason most players view future wagering in the same way they would regard a flaming bag on their porch is because of the uncertainty that such wagers inherently carry with them. After all, one is not only betting that a horse will be pointed for — and draw into — a particular race (in this case, the Kentucky Derby), one is also throwing down cash on the horse to win said race. And if Robert Burns was correct about the best-laid plans of mice and men often going astray, imagine the pandemonium resulting from the best-laid plans of men and racehorses. Still, that is no reason to snub the Kentucky Future Wager (Pool 2), which opened on Thursday and closes Saturday evening. Simply put, there is value to be had in these pools. 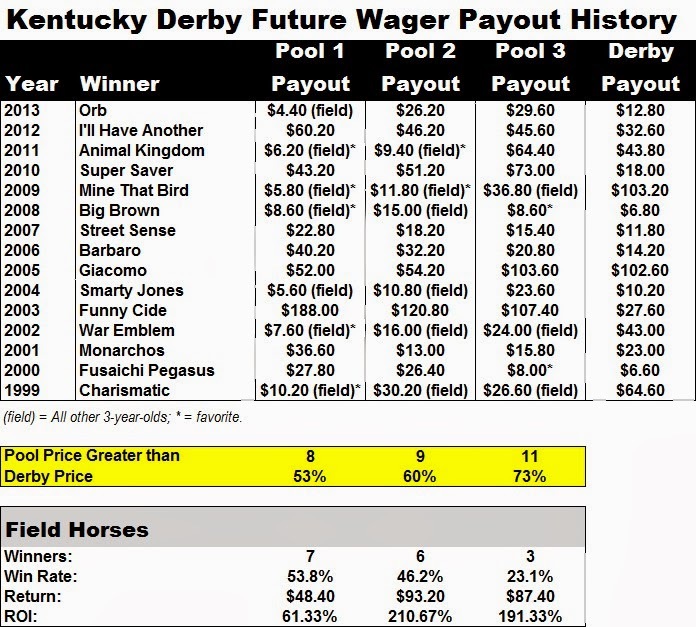 Case in point: Since the inception of the pari-mutuel future wager in 1999, betting the “field” in each pool has produced a cumulative net return of $5.08 per $2 wagered — that’s a return on investment of 154 percent. And, in fact, Pool 2 has offered the greatest ROI (in excess of 200 percent) on field horses (those not listed individually). COMMENTS: This colt has shown a lot of talent… on turf. But will that translate to dirt? I’m a little cynical. Plus, I fear that the price will be on the short side, thanks to the big reputation Ken and Sarah Ramsey’s homebred has. COMMENTS: Distance may be a factor, but the son of Pioneerof The Nile (second in the 2009 Kentucky Derby) has made all the right moves so far. COMMENTS: I like this guy — a lot. Not only has he shown vast improvement from his debut on Aug. 17, but I love the fact that he makes his move on the turn. That is a potent Kentucky Derby angle (witness Animal Kingdom). COMMENTS: This dude shows a ton of early foot — maybe too much early foot — but I do like the attempt to rate in the Breeders’ Cup Juvenile. COMMENTS: Right now, his reputation exceeds his ability. COMMENTS: I suspect this horse might need some of Floyd Landis’ beer to get a mile and a quarter on the first Saturday in May. COMMENTS: Son of Distorted Humor is going to have to show that he can come off the pace and win, but nothing — at least at this point — indicates that he can’t. COMMENTS: I have a ton of confidence in Bob Baffert when it comes to developing Derby stock, but Midnight Hawk looks like an underlay in this pool. COMMENTS: Given the fast pace, the colt’s performance in the BC Juvenile can be excused, but nothing else grabs me by the throat at this point. He looks like a Pool 2 underlay to me.